Experts are forecasting a sunny year ahead for Australia’s solar sector, as it looks to use new technology to build on the successes of 2017. Last year was regarded as a breakthrough year for Australian solar, with dozens of plants being financed on a debt basis, both by commercial banks and public sector lenders. Furthermore, banks Down Under continued to turn their back on the dominant coal sector, adding further fuel to the view that renewables will provide the bulk of the country’s future power generation. The government-owned Clean Energy Finance Corporation (CEFC) surpassed the 1GW of solar investments funded in December and has continued its spending spree into the new year. The 80MW Oakey Park solar farm in Queensland has secured A$55mn in CEFC debt for the second stage of its development, building on an initial loan of A$19.5mn. The investment will also fund forecasting technology, which helps deliver solar energy more reliably to the grid. Solar power is categorised as “intermittent generation”, that is, a form of power that cannot control when it is supplied into the grid. Forecasting technology is designed to predict unexpected dropouts in generation, allowing grid operators to make a more certain plan for how much energy will be delivered, and when. This is the first time that forecasting technology has been funded by the CEFC, but it is likely to be a cornerstone of its investments in the future. Monique Miller, director of corporate and project finance at the CEFC, describes this technology, along with that of storage technology, as a potential “game changer”. In another measure of the progress in Australia’s solar market, Oakey 2 is being developed without an offtake agreement – an arrangement that became more common in the sector through 2017. The developer is Canadian Solar, while Foresight Solar Fund is equity partner. Despite the lack of offtake agreement, Canadian Solar general manager, Daniel Ruoss, expects it to be “grid connected by the end of 2018”. 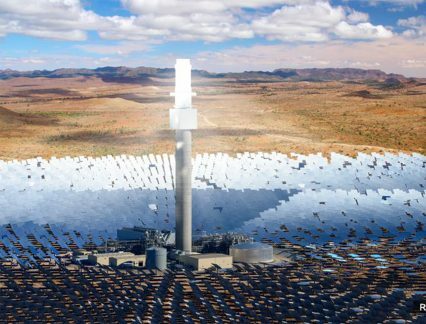 In another boost to the industry, the biggest solar thermal power station in the world this week received the go-ahead in South Australia. The Aurora Solar Energy Project in Port Augusta will have eight hours of storage capacity, which will allow it to operate in the same way as a coal or gas power station. It will cost A$650mn, although the source of financing has yet to be confirmed, and will provide 100% of South Australia’s government electricity load from 2020, generating 495GW of power each year. The South Australian energy minister Chris Picton says that “South Australia is fast becoming a global centre for the development of renewable energy with storage, with a range of other projects set to come online over the next few years”. The project sponsor is Solar Reserve, whose CEO Kevin Smith described it as an “important milestone” for the sector. “The remarkable story of the transition of Port Augusta from coal to renewable energy – which won a competitive tender against fossil fuel – is also a preview of the future of power generation around the world,” he says. Miller says that the recent developments in the industry are down to a variety of factors. “The cost of solar has come down significantly, due to the lower cost of manufacturing overseas but also due to local contractors bringing in international experience and being able to build the projects much more efficiently than in the past. The approvals process is quite quick too, which is great when you’re staring down the barrel of the renewable energy targets. In the last year, it’s been the right time for projects to be operational. There’s been a real push and the timeline to get an individual solar project up and running is much shorter than the others, such as wind and biomass,” she adds.